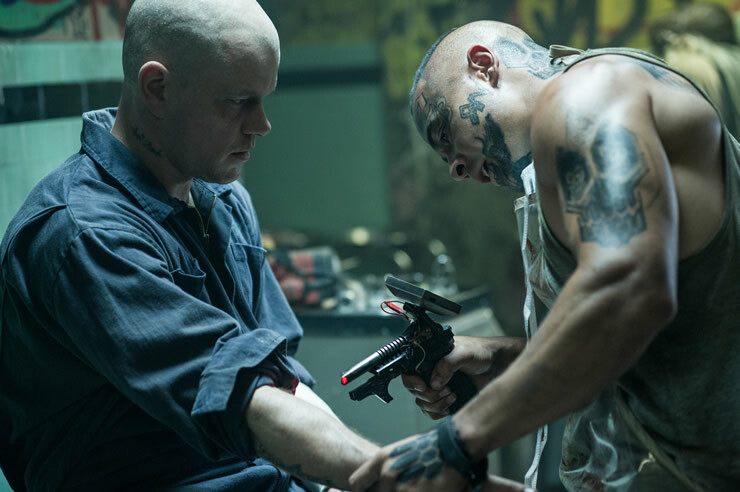 Reviewing Neill Blomkamp’s Elysium, Steve Sailer emphasizes the dystopian future resulting from non-White immigration. That’s certainly there. The bleak, run-down buildings (filmed, appropriately, in Mexico City), the garbage-strewn streets teeming with poor non-Whites. There’s the everyday violence and the brutal robot police. Unfortunately, the emotional core of the movie is that the teeming non-White masses have moral claims on the overwhelmingly White folks living in Elysium, the space station that slowly orbits above the future Los Angeles. 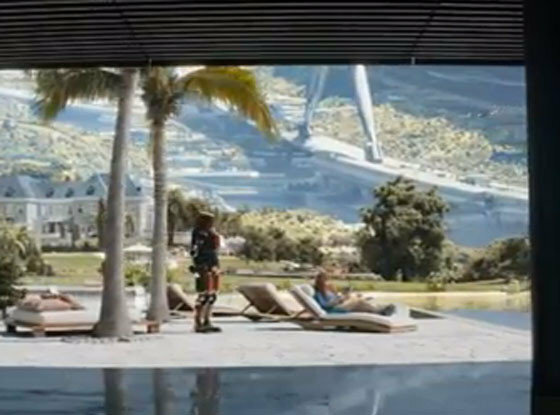 Elysium is everything that the future LA is not: uncrowded, populated by well-dressed, well-mannered, civilized (overwhelmingly White) people with refined tastes, excellent health care, and large mansions with robots waiting on women reclining next to gorgeous swimming pools. And no tattoos in Elysium, unlike pretty much everyone back in LA. Everyone on Earth wants to get to Elysium, and who can blame them? Matt Damon with another upstanding citizen of the future Los Angeles. While Elysium is a paradise of wealth and refinement, it lives off the wealth created by the mainly Brown masses back in LA. The White owner of the robot factory where Max works has created a brutal work environment where Max is forced to endure a lethal dose of radiation in order to keep the production line going. The factory owner then gets in his space shuttle and commutes back to the idyllic world of Elysium—an image that conjures up rich capitalists helicoptering to work and then going home behind thick walls in gated communities in Beverly Hills. These Elysium capitalists are doubtless advocates for open borders because with the glut of low-skill labor, their employees have no choice but to work for slave wages, while the owners can easily escape the horrors they have created down below. This is a very close-to-home metaphor for the role of business interests in destroying America. (Short history of immigration: The business lobby was held in check by popular demand for immigration restriction until ethnic lobbying led by the organized Jewish community resulted in the sea change in immigration law in 1965.) As Sailer points out, conservative commentators have blasted the film as socialist propaganda. But the real message for conservatives should be that if you champion open borders and create this horrific version of the future Los Angeles, it will only work if you detach yourself from any moral feelings toward those left behind. 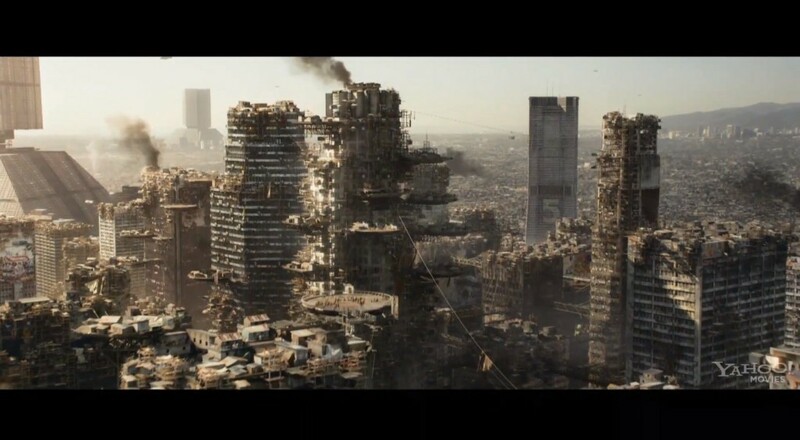 In the movie, some of the citizens of Elysium have no moral concerns about those living in the hellhole below. 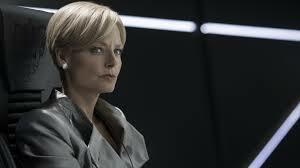 Jodie Foster plays the hard-nosed Secretary of Defense Jessica Delacourt who is perfectly willing to shoot down the spaceships of the proles attempting to get to Elysium. But the president of Elysium, played by a Pakistani-American actor (thereby showing that Elysium is not exclusively White—thank God for that!) is soft on the invaders, provoking a coup attempt by Foster. Nevertheless, even the present regime deports invaders. A scene shows them as a howling, dark-skinned mob crammed like sardines into cages as they wait for the ships that will take them back to Earth. From the standpoint of immigration patriotism, the film certainly could have been better. Delacourt does indeed talk about the need to preserve Elysium for her children, which could be construed as a racialist message given the overwhelmingly White population of Elysium. But there are clearly non-Whites among Elysium’s elite—I noticed a few East Asians, and the Pakistani-looking president stood out. One must of course hope that these were enough to bring a little vibrancy to the staid Elysians. But it’s like all those movies where the White nationalist characters who spout this sort of thing but are portrayed as heartless and out of touch. Delacourt’s appearance is severe—short hair and very angular, harsh facial features, no emotional life. It’s hard to see her caring for anyone. If there is supposed to be a moral message coming from Delacourt, it certainly didn’t get through to me. We never see Delacourt’s children, so there is no empathy for them or what their future will be like when the gates are torn down and Elysium is overrun by non-Whites. On the other hand, the film’s emotional core is the love relationship between Max and Frey Santiago, a Latino nurse with a daughter who is dying of leukemia. The emotional core of the movie, therefore, is the moral claim that people like Max, Frey and her daughter Matilda have on Elysium. Max (because of his radiation overdose) and Matilda are in desperate need of medical care that can only be obtained in Elysium. Both Frey and Max are presented as intelligent and hard-working. The implication is that huge numbers of those suffering in the Los Angeles of 2154 are good, honest, hard-working people who deserve to have the comforts and medical resources available on Elysium. Life in Elysium: Relaxing at poolside with an attentive robot waiter. The film ends without saying what the long-term effects of granting Elysium citizenship to everyone would be. I suppose that the utopian Hollywood ending would be that multiculturalism would triumph and everyone would be happy and economically well off. They would be living in safe environments, and they would have great medical care. Matt Damon, the real life über-liberal probably sees it that way. But the hordes of desperate non-Whites boarding the shuttles to Elysium are far more suggestive of a Camp of the Saints future where everyone will be miserable. Dividing Elysium’s wealth among the teeming, overpopulated masses would leave everyone impoverished. Can Elysium even afford to give medical care to the millions who would need it? And why would they want to go back to LA after seeing the luxuries of Elysium? Given the moral framework of the movie, I found myself out of sympathy with the image of Brown people asking for stuff from rich White people. The little Brown girl and her mother reminded me too much of all those pro-amnesty rallies and other demonstrations geared at pulling the heartstrings of White Americans in order to leave failed states like Mexico and get access to the economic benefits of American society. It reminded me too much of all those LATimes articles portraying poor, super-competent striving Latino immigrants who would thrive except for White racism. So I couldn’t root for Frey and Matilda. But I couldn’t root for the White overlords who created the situation in the first place either. The only ones we get to know are the cold, unemotional, ruthless Delacourt and the factory owner who brutalizes his employees while working hand-in-glove with Delacourt. Then there’s the sociopathic Agent Kruger, a White male who is also an ally of Delacourt and greatly enjoys killing the proles. The Whites of Elysium are not a sympathetic bunch. Without any emotionally compelling characters on either side, the film was a flop for me. But in a larger sense, there is a profound moral here: the moral imperative of preventing the world depicted in Elysium from developing in the first place. In an interview, Blomkamp says he is “painting this realistic image of a future Earth…which meant the borders being erased entirely and having this fluid population group that basically moves from Chile all the way up to Canada. It just flows, because it can.…The numbers of people that are Latin are going to overwhelm the numbers of people that aren’t. The world depicted by Elysium is exactly the world we are headed toward. The vast majority of the immigrants allowed in under current U.S. immigration policy and even more so as envisioned in the Schumer-Rubio bill are uneducated and poor; and they will be able to bring in their relatives, for a grand total of at least 30 million in the next 10 years. Meanwhile, the middle class is disappearing. But it’s great for the elites who run things now. It will be even better for them in the future, and much worse for everyone else. Blomkamp missed a great opportunity to present a morally compelling account of the plight of White, middle-and working class people who are in the process of being displaced by the non-White invasion. The movie is set in the future 140 years from now, when Whites have all but disappeared except for the relatively few among the Elysium elite. The disaster for the great bulk of the White population has already happened. They are nowhere to be found apart from a few relics like Max. What we need is a film that shows middle- and working-class White people being displaced and disempowered at the behest of elites who control the media and finance the political system. Unfortunately, such a film would not be sci-fi fiction. It could be set in the present or the near future. The story of White dispossession as a result of the actions of our hostile elites is far more morally compelling than anything presented in Elysium. 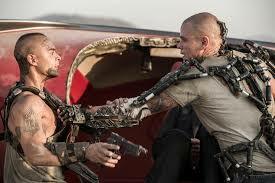 What we are living through now are the early stages of the development of the brutal, horrendous world depicted in Elysium. Most Whites still aren’t aware of what the present trends portend, and a great many live far away from the clear signs of what the non-White future will be like, oblivious to the long-term consequences of current policies. The good news is that perhaps some of the Whites viewing Elysium might, at least implicitly, be getting the message that the horrifying future depicted in Elysium, would be a disaster for them and their children and do all they can to prevent it.